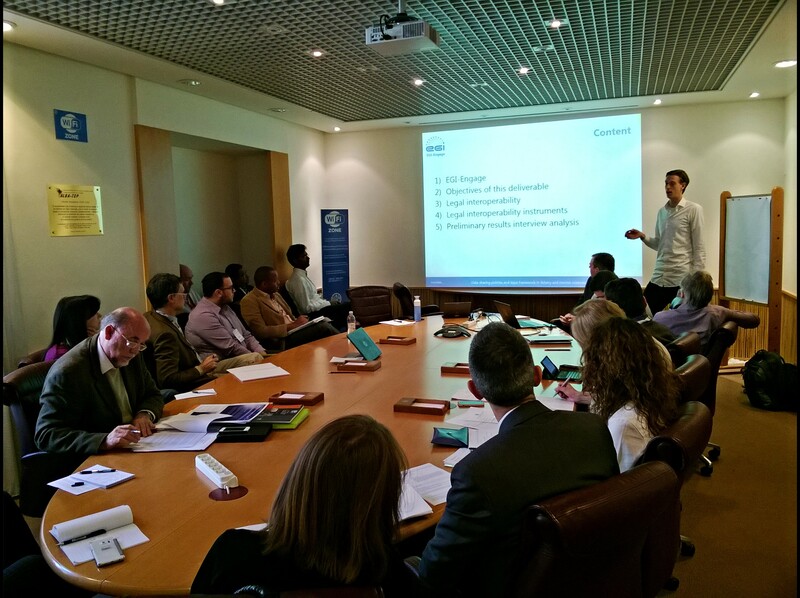 A presentation and discussion about legal interoperability was recently held in FAO within the context of EGI-Engage Project (Engaging the Research Community towards an Open Science Commons). This blog summarises briefly the concept of (i) legal interoperability and (ii) presents the AGRIS workflow as an example of an initiative dealing with legal interoperability issues within the agricultural domain. Besides institutional challenges regarding the appropriate policies to manage data, open data, sharing and reuse – there are inherent conceptual and legal issues arising from sharing and reusing data. This was a presentation by two consultants with experience on legal aspects related to data sharing and interoperability, hired to resource the EGI-Engage deliverable, “Report on Data sharing policies and legal framework in the fisheries and marine sciences domain”. This meeting sought to highlight and further consult on the findings of issues related to legal interoperability and data sharing in the Food and Agriculture Organization of the United Nations. The presentation identified issues and brought some considerations towards internal inputs to the development of a FAO position on Big Data, collaborative science, data interoperability, and open data – with a specific consideration to the Fisheries and Marine data. Aggregating data in the world of data producers raises a number of legal issues, the term “legal interoperability” addresses the process of making legal rules cooperate across jurisdictions. There is need also for the laws to facilitate the idea of true openness. Review slides 7 to 10 in the above presentation. Within the data community and the Research Data Alliance – the RDA/CODATA Legal Interoperability IG was established to offer guidance in this area. Follow the activities here. The presentation also covered a number of case studies in the agricultural domain dealing with sharing of data and how they were handing legal and licensing issues. The highlighted projects included – AGRIS, Land Portal, TAPipedia and ICARDA from CGIAR. AGRIS receives data from more than 180 organizations (obviously with different licencing arrangements). AGRIS partners developed a system to handle AGRIS data workflow and submissions. Through this system the AGRIS data processing centre checks the received collections and in most cases bibliographic data is not covered by licences. AGRIS relies on FAO copyright in exposing its data and the AGRIS Acceptable use policy is stated here. In order to facilitate the wider usage of AGRIS data, data providers are encouraged to accept the Creative Commons Attribution 4.0 International. EGI-Engage aims to accelerate the implementation of the Open Science Commons by expanding the capabilities of a European backbone of federated services for computing, storage, data, communication, knowledge and expertise. Submitted on 24 Mar 2016 by AGRIS Team .